10 year old Helen Karipidis was playing in the playground attached to the unit complex of 454 Illawarra Road, Marrickville, Sydney on the 22 December, 1988. She was playing with a group of friends, none of whom were aware she had disappeared, when her father noticed her missing at 8:30pm. Helen has never previously been reported missing. At the time of her disappearance Helen was in good spirits and looking forward to Christmas. There are grave fears for her safety. Reported missing to: Missing Persons Unit. A 10-year-old Sydney girl who disappeared in 1988 may have been raped and beaten before she went missing, an inquest has heard. 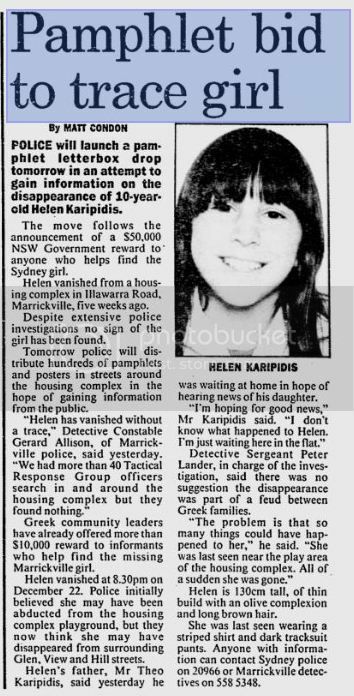 Helen Karpidis was last seen about 8.25pm (AEDT) on December 10, 1988, wandering around a housing estate at Marrickville in Sydney's inner west where her mother and six siblings lived. Shortly before, she had been playing with other children at the complex, but she did not return home for dinner. On the opening day of an inquest in Parramatta, former schoolteacher Anne Martin described how she had counselled Helen's older sister Maria about two years after Helen's disappearance. "She used to say to me that she had lots of terrible secrets," Ms Martin told the inquest on Monday. She said Maria, who later committed suicide, felt responsible for her sister's death because she did not accompany her on the evening she went missing. The inquest heard that their parents' relationship soured in 1987, when family and community services intervened. Their mother Voula was awarded custody of the children and moved out of the Marrickville family home and into a nearby housing estate. Ms Martin said Maria had told her that she and Helen were afraid of their father Theo. "He had one of them on the floor and had his foot on her neck," she said Maria told her. "I got the impression it happened more than once." Maria had also told her that two boys in the complex, one named Johnny, had raped Helen. But Maria had also said Helen was preparing to run away and had disappeared at the same time Johnny left the housing estate. Ms Martin said she had failed to convince Maria to make a formal statement about her allegations. June Adams told the inquest she was working at a local newsagent on the day Helen disappeared and remembers a man of Asian appearance whom Helen did not know but who gave her money to buy herself glitter. The inquest is to resume on Wednesday, when it is expected to conclude. A YOUNG girl who vanished nearly 25 years ago while playing outside her family's housing complex could have planned to run away to escape an abusive home, an inquest heard today. 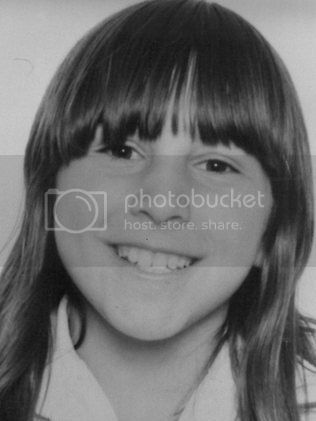 10-year-old Helen Karipidis was last seen near the Marrickville townhouse development where she lived with her mother and six siblings on December 22, 1988. Helen had been playing with a group of children from the complex in the late evening twilight, but she couldn't be found when her mother Voula Karipidis asked for her to be called for dinner. An inquest into her disappearance was told today that police had investigated a number of scenarios since she went missing, including the 10-year-old being killed and hidden by her family or another resident of the complex, or that she had "simply run away". Sergeant George Lolis, assisting the coroner, said police had no remaining leads and the investigation had now been suspended for several years. But Anne Martin, a teacher who formed a "close bond" with Helen's sister Maria, told the inquest her troubled student had detailed disturbing allegations of abuse a few years after the 10-year-old's disappearance. "She felt responsible (for the disappearance) because she said she should have gone with her that night," she said. "She said that she told Helen not to go alone, not to ever go anywhere alone without her. "She said that Helen was very unhappy and wanted to run away." Ms Martin said Maria, who was 12 when her younger sibling vanished, claimed her father Theo Karipidis had been "fiercely violent" to the children at times. "One time (she said) he had one of them on the floor and he had his foot on their neck," she said. The girls' parents had recently separated at the time of the disappearance and Mrs Karipidis had been awarded custody of the children, the inquest heard. Maria also claimed a "nice man" regularly took both girls to Kings Cross where they took their clothes off and were photographed. "She kept saying that no-one could help her," Ms Martin said. Mr and Mrs Karipids, who were present in court, suggested Maria had bipolar disorder and was prone to "making things up", but Ms Martin said she had always found the girl to be truthful at school. Maria committed suicide at 18 after earlier attempting to kill herself on the anniversary of Helen's disappearance. Did 10-year-old Helen Karipidis run away 25 years ago or meet with foul play? NEARLY 25 years ago Helen Karipidis was happily playing outside her family's home a few days before Christmas - by the time she was called in for dinner the 10-year-old had vanished. Yesterday an inquest into her disappearance heard she could have been planning to run away to escape an allegedly abusive home. Helen had been sharing a house at Marrickville, in Sydney's inner west, with her six siblings for only a month after her parents' relationship broke down and her mother Voula Karipidis was awarded custody, the inquest was told. Sergeant George Lolis, assisting the coroner, said police had investigated and ruled out various scenarios including a family member or stranger killing her, or that she had run away. But Anne Martin, a teacher who formed a "close relationship" with Helen's older sister Maria after the disappearance, told the inquest she heard disturbing allegations of abuse. "(Maria) told me their father was fiercely violent at times towards them ... they were both very afraid of (him)," she said. Maria, who was 12 at the time her sister vanished, and who committed suicide when aged 18, claimed Helen was "preparing to run away and had wrapped her Christmas presents early", Ms Martin said. "(Maria) felt responsible because she said she should have gone with her that night." The girls' father Theo Karipidis and mother, who were in court for the inquest, suggested Maria had been prone to "making things up", but Ms Martin said she had always found her to be truthful.